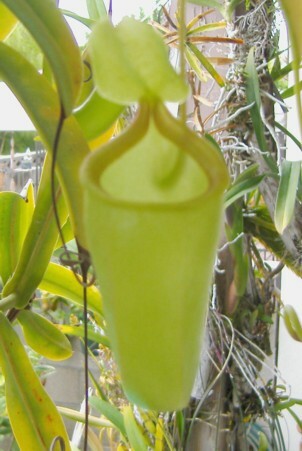 This hybrid is between two highland species; Nepenthes maxima and Nepenthes ventricosa. It seems to produce two different colored pitchers. 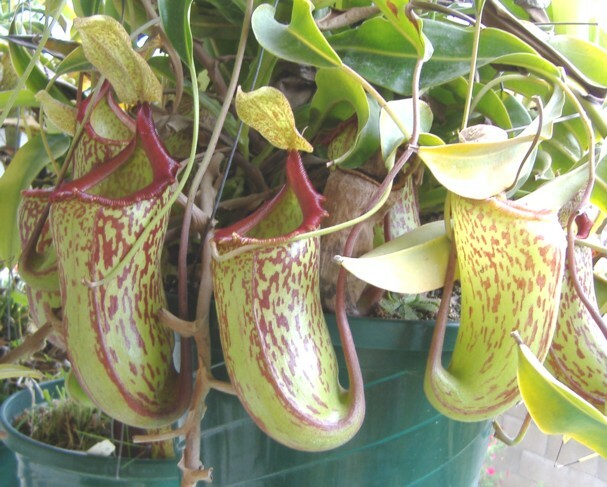 The lowers have the maroon peristome and streaked pitchers while the uppers are pure green! They have no red whatsoever in them. This plant has flowered several times for me and is a male plant. It's a beautiful and vigorous hybrid that turned out to be a very nice plant. Last I looked it must have 7 or 8 growth points and keeps on going. It also roots readily from cuttings. A hybrid from Exotica Plants that has the same parent species is being marketed as N. X "Red Leopard" and is readily and looks exactly like this one. This hybrid is very easy to grow and a great starter plant outdoors. Market availability: size 3 to rooted cuttings; common, similar to Exotica Plants hybrid "Red Leopard"